Being a modestly-sized island [unlike Australia], with a efficient and well synchronised national transport system [unlike Australia] traversing Japan is, relatively, a breeze. That being said, Japan’s two most popular cities, Toyko and Kyoto are a couple of hundred kilometres apart and so if you’re considering moving around whilst travelling it’s well worth considering flying into one airport and out the other- Kansai aiport being Kyoto’s closet- instead of the traditional return flight in and out say, Tokyo. This will save you at the very least, a four hour bullet train ride back to the airport. That being said, sometimes you can snag some great deals that are only for return flights, so play it by ear. If booking online I recommend checking out the prices of different flight combinations and see what works out the least expensive. We travelled return with Jetstar, flying into the more southern Kansai/Osaka airport and flying out of Tokyo. Once inside the country, first contact with the Japanese transport system can be slightly overwhelming. Yes, they do it differently but it is surprisingly intuitive and un-surprisingly efficient. I was swooned by the Japanese rail system. Whether it was the incessant jingles for each station or the heating system under the seat, or the frequency of suburban trains and subways, there wasn’t much to dislike about riding the rail. My only complaint would be the tickets are too damn small. We didn’t buy return trips not only because we didn’t know how but because I’d surely lose it after a day of adventuring. A warning those playing on late nights: trains do stop at midnight. Taxis are just as expensive as they are in Australia [e.g. very] with the exception of short trips were we found the meter to be uncharacteristically kind. A tip for buying your first rail ticket. Before you make your way to touch screen machines mounted on the wall check the map above [preferably the English one] that will tell you how much the fare is from your current station to your destination. Simply throw in change or note, select your fare amount [note, not destination] and you’re right on your way. What we didn’t know until late in the trip was the ability to adjust your fare post travel at the aptly named ‘fare adjustment’ machine. If for instance you are running late, you can skip the board, throw the minimum fare in of 130yen and jump right on, and once you reach your destination make your way to a fare adjustment machine that will validate your ticket after you pay it the difference. It’s truly ingenious. Going from Shinjuku to Tokyo airport I bought a 130yen ticket and had a fare adjustment of 1700yen [20auds] on the other side. The best known and most extensive rail network is the government owned Japanese Rail, better known as JR. It competitively runs suburban routes and almost exclusively interstate rail- most noticeably the famed Shinkansen, better known as bullet trains. Planning a trip to Japan you’ll invariably come across the JR PASS: a tourist-only pass that allows unlimited travel on most JR infrastructure for either one, two or three weeks. Dave and I purchased a three week JR Pass for 600aud [570USD]. Shop around online as there are numerous agencies selling JR Passes and price is subject to fluctuation with the changing dollar. We found traveljapan.com.au had the best price at the time we were looking. As we were staying longer than three weeks we had to be slightly tactical when to activate the pass [you choose when to start your one, two or three week pass by exchanging your receipt for a pass at a JR station office.] We ended up saving around $150AUD [135USD]. But, JR passes aren’t for everyone. As I mentioned above the JR pass covers most public transport across the country; what it doesn’t include are a handful of bus and ferry routes and most noticeably the Nozomi shinkansen- the fastest train in their fleet. A word of warning: Guards stroll through carriages validating tickets so don’t get caught on a nozomi or you may lose your pass- but if you accidently jump on one like Dave and I might have, pretend your asleep. Long creatures these Shinkansens are…atop Kyoto tower. Another tip is Japanese trains offer a variety travel experiences much like a plane. They have a business class option that they call ‘green’ carriages. There are also reserved and non-reserved seating. A reserved carriage is for people who have paid an additional fee to secure a seat allocation for the trip. As a JR pass holder your ticket allows you purchase a reserve at no additional cost. Dave and I tried both reserved and non reserved seating, and actually preferred non-reserve as you could use the seat next to use for luggage and not have to worry if it had been purchased by someone. But reserve seating does eliminate the possibility of not finding a seat on a packed train- a real possibility, especially in peak season during autumn and spring. My advice is to arrive 15-20 minutes early to stations to purchase a reserve seating ticket from the JR station office. If there are two of you travelling, ask to be placed in different rows so you have a spare seat next to you for your luggage or better yet, if you are travelling with a large suitcase, ask to be seated in the first or last row of the carriage as they have extra room. More on luggage below. Basically, your JR Pass is most useful for interstate travel between cities where you ride the Shinkansen. Paying full fare for these trips can cost upwards of 120aud and so if you ride between four or five cities over the three weeks the pass will have saved you money. The pass is also useful travelling to more rural towns, whether as a day trip from a major city or to visit, which are usually only serviced by a JR station and cost anywhere from 25aud to 75auds. The pass isn’t quite as useful traversing through the suburb jungles of Tokyo or Osaka where private line trains rein supreme or even smaller cities like Kyoto and Hiroshima where buses and trams, respectfully, are the backbone of the city. Unlike Sydney, the Japan rail network is made up of both the public JR system as well as a number of private train lines and so a JR Pass doesn’t necessarily cover all your travels, as some destinations are only accessible by private line. Although JR still has a number of suburban subway and bus routes so you won’t always have to fork it out of your own pocket- and if you do, the good news is that suburban travel is well priced; you can ride across Tokyo for around 2aud one-way. The bad news is: it adds up! When budgeting for travelling, keep in mind there will be more than a handful of times your pass won’t get you to where you want to go. So if you are considering travelling to only one or two cities- say Tokyo and Kyoto- a JR pass may not be the most economical choice. Adversely, if you are planning on doing a number of day trips outside of each city, it could stack up. My advice would be to confirm your itinerary before you consider purchasing a pass. Once you know where you want to travel, you can use the life-saving Hyperdia [Japan’s very-own trip advisor] or it’s even more convenient app [the crux being both need an internet connection to work, so not so handy if you’re out on the field] to calculate the cost of each journey and quantitatively conclude which option is healthier for your wallet. Another great resource if you decide to purchase a JR pass is http://jprail.com/, an well-established blog run by a generous Japanese man on the best and cheapest ways to use your JR pass around Japan, especially in major cities. Keep in mind that JR also has regional subsidiaries so if you are only spending your time in one area of Japan, or doing the majority of your travel in that area, a JR area pass could be a go. In fact, there are plethora of passes and tickets to choose, both JR and non JR, that cover different combinations of transport for varying amounts of time. My go to resource was japan-guide.com, specifically the transport section of each city guide. Lastly, I found the most expensive part of travelling was to and fro airports. Especially out of Nartia airport in Tokyo, which to the disbelief of many is actually over 90 minutes by road away from the city center, there are multiple options of varying costs and lengths of time. You can take the JR NEX express, the JR sobu line, one of a number of Keisei [the only private servicing Nartia] express services or even a bus service by the name of ‘limousine bus’…or even a 250aud taxi ride in you need to shed some weight off the wallet. For those looking to travel as cheap as basically possible this is what I recommend. Take the JR NEX, their specialty express service. Although flashy and exy at 3000yen [34auds] if you flash the desk your passport you can get on for half price and it is the quickest route into the city. Unfortunately this deal is only from Narita and so coming back take the cheapest option that is the JR Sobu suburban line from where you are to Nartia. From anyone in the Tokyo circle it shouldn’t cost you more than the 1500yen you spend on NEX. The trip takes a bit over 90 minutes. Depending on the time of your arrival and how much time you are prepared to spend it’s possible to make your way into the city circle for around 1400 yen or [16auds] via the suburban JR service on the Sobu line- taking a little over 90 minutes. Public transport aside, bikes are a great way to see a city. We spent a day trip cycling around Okayama. For another day trip we also biked part of the Shimanami Kaido in Onomichi. Unlike in Sydney, bikes are widely thought of as a legitimate mode of transportation [which they very much are]. If your hostel/hotel doesn’t offer bicycle rentals [they should] then a bicycle rental shop will never be too far away; both are very well priced at around 5-6auds/day. 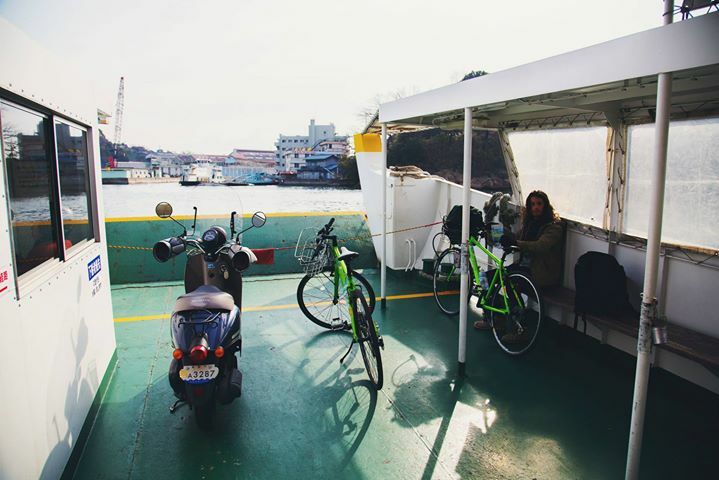 Cities such as Kanazawa have installed bike stations where you can rent a bike from a machine and drop it off at any number of bike stations situated around the city. Cycling isn’t always the best option. Kyoto has been struggling to manage cyclists and has implemented parking restrictions for bikes that I’m told they police quite strictly. In fact, our hostel suggested we just walk to avoid the hassle of trying to find a stop to park the bike. Throughout our month travel across the Japanese mainland we stayed in healthy mixture of hostels and business hotels. Now don’t go thinking we travelled in luxury, phonetically misleading, business hotels are in fact budget accommodation geared towards salary men and women travelling interstate for work. They offer a well-kept hotel, with basic amenities and small rooms. Surprisingly, the cost to say in many of these business hotels was the same price [and at times cheaper] than surrounding hostels. Japan is one of those destinations were sleeping ain’t cheap. You’ll be hard pressed to find accommodation for under 25auds a night. Both business hotel and hostel had their advantages but I would say the companionship and mingling that comes with staying in a hostel ultimately trumps the private bathroom and amenities of the budget hotel. Although ultimately our decision for each city was a case by case. For the hostel-inclined, there are a number of well-known hostels chains around Japan that are worth considering. We stayed in at a K-house hostel twice, both Kyoto and Takayama and had no complaints. There is also J-hoppers and Hana Hostels, which we heard good things about. I wouldn’t hesitate for a second to stay in a hostel in Japan as like their streets everything is spotless and well-kept. One business hotel chain worth mentioning is Dormy Inn, where we stayed in Kurashiki. We especially enjoyed the Dormy Inn as their chain of hotels feature a dedicated bath house level. This was our first ‘Japanese bathing’ experience and in retrospect it was the ideal place to learn the ropes in a quasi-traditional setting as so much as the more discerning community bath houses or onsen. Whether staying in a hotel or hostel you’ll invariably encounter the ‘Japanese sized’ room. For those looking for accommodation on sites such as tripadvisor, hostelworld.com and booking.com, an incessant complaint from reviewers were the tight room sizes. Basically, urbanisation hit Japan harder and faster than most and so over the years it has become acceptable to build and live in apartment blocks/hotel rooms the size of large western bathrooms. Undoubtedly the rooms are cramped, but Dave and I never found the size a real hindrance and thought the reviewers were being overtly dramatic. You may have to hop over a suitcase to get to the bathroom but if you are merely waking up and sleeping there it won’t cause any harm. A word of advice we were given from a young couple were for pairs to consider a twin room instead of a double as the double rooms were in fact smaller and more cramped. In Tokyo we used Airbnb. Not surprisingly accommodation within the inner circle of Japan’s capital was obtusely more expensive than the other cities an ideally we didn’t want to compromise with a cheaper accommodation towards the city fringe. Airbnb offers a number of great apartments across the inner-circle Tokyo [not so much else where in Japan] and we settled on a room in Shibuya, for less than half the price of a near-by hotel and twice as spacious- not to mention with our own kitchen. Admittedly it was more expensive than our other Japanese accommodation [as were most options on Airbnb] but it was invaluable to be staying in the neon-beating heart of the mighty megalopolis- a mere crawl away from one of the cities major station and a buzzing nightlife right on outside our doorstep. We do know those who opted to stay in hostels located further out from the city- basically, it is doable, just less convenient. As well as our sleeps in hostels and hotels we at times opted for more traditional lodging a number of times during our trip. In the culture-capital Kyoto we opted to stayed in an old [and creeky] edo period building that had been turned into cozy, budget style accommodation, that set us back only 5auds/night more than a western-style hostel. There are also many traditional homes that have taken one step further and become a deluxe bed and breakfast, known as ryokan [silent ‘r’] Here you are treated to a traditional feast, bedding and Japanese hospitality. As mentioned earlier, we stayed in a minshuku- a slightly less exclusive and expensive ryokan-where we ate arguably the most delicious meal on our trip. Another traditional lodging we stayed in was an onsen hotel. Although you can visit onsens by day there are also dedicated onsen hotels for the more the obscurely located [and elite] hot springs. We stayed two nights at Takaragawa Onsenkaku after Aussie singer-songwriter Josh Pyke raved about it in this article in the Guardian. Takaragawa is actually slightly overwhelming in its beauty [go to their website it will leave you speechless] and could easily pass as a real-life backdrop to a Studio Ghibli film. 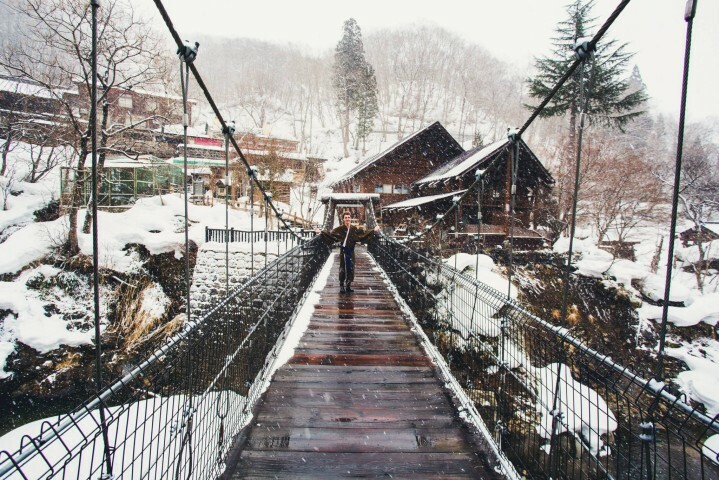 The hotel is perched on a trickling river that holds onsen pools on either side. If arriving in winter, the place is covered with Japan’s infamously fluffy snow that seems to fall perpetually, only adding to the magical vibes the place oozes. Beyond Takaragawa’s astounding aesthetics the onsen hotel was a little off the Miyazaki charm. Firstly across the main bridge that connects the onsen and accommodation, there are three bears that live in small cages. I had read about this before visiting and to be honest thought people were being dramatic in saying how it detracted from the experience but in retrospect I’d have to agree; walking past the cages each time you enter the onsen isn’t ideal, especially for the animal-lover, to which I am not. What makes me think it could very well be skin was that the fact that the public showers to clean yourself before you bath were located on the other side of the building and so I hypothesis many guests- the majority non-Japanese might I add- would skip the shower, and the dead-skin they would scrub off pre-onsen softened and floated away after many hours of being submerged. This leads me to my last gripe, that is that the tranquility of the onsen was too-often shattered by gossiping tourists, both English speaking and not. Also, the place was huge. On top of the original building pictured below that we stayed in [and were happy with- for those about to book, as you can preference buildings] there are a number of newer buildings to meet demand. Unfortunately this meant a sort of impersonal feel to the place and at times felt more like an institution than a place of hospitality. In saying all that there were also a number of great things Takaragawa offered up, including the traditional gowns [48 hours of freedom, if you know what I mean] and the first night’s traditional dinner [although both the breakfast and second dinner wasn’t half as lavish] among other things. Would I recommend it to people who haven’t been? I would, but probably not the three nights that Mr Pyke strongly suggests. As I mentioned we stayed two nights but really, you get the vibe after the first night and if you make the most of the onsen that night [it’s all hour access] you’d get the basic picture. For me there was more tranquility in the night stay in the Minshuku and the accompanying walk than Takaragawa where unfortunately there were just one too many inconsistences to really allow me to reach a meditative state. What I’d truly recommend is staying over night at an onsen, but researching and considering other locations. Takaragawa is convenient if you want a retreat before/after/during your Tokyo stay as it’s only 2.5 hours outside the city, but there are other fantastic onsens in the Kansai area and even further down near Okinawa. My next onsen experience will be at a onsen-town, the more traditional over-night onsen experience, something I think prospective traveller looking for an overnight onsen experience should consider. There are two more traditional accommodation worth mentioning- both we didn’t get to stay in but have heard great things about. Firstly, in certain town you can opt to stay overnight in a temple overnight. This is a great way to gain insight into the life of monk, and I’ve been told you are able to take part in their daily rituals whether it be meditating, morning prayer, chanting etc. 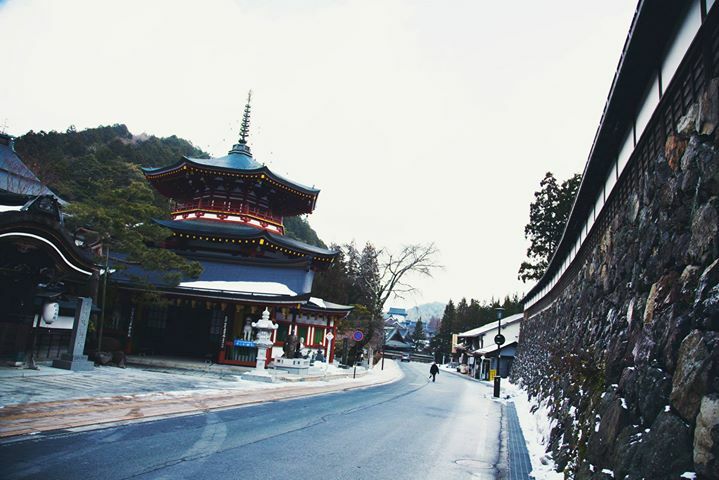 Probably the best known place for temple lodging is the secluded Mt Koya, a two hour train/ropeaway and bus ride from Osaka. We visited Mt Koya as a day trip from Osaka but wouldn’t think twice about staying overnight in a temple. The other, even more niche lodging is an over night in a traditional farm house in the small but iconic village of Shiragawa-go found in the regional countryside of the Chubu region. We were lucky enough to check out the village as part of the the annual Light Up festival, but couldn’t snag accommodation unfortunately. Those who have stayed in a farm house rave about it so it’s well worth checking out! Below is a list of my pre-trip itinerary originally posted in Japan Pt 1. An Introduction and Itinerary. Each city is a different colour, and the clear strip holds the name of the accommodation we stayed in. Online you’ll incessantly come across recommendations to pack as light as possible when travelling to Japan. Always a good rule of thumb to pack on the modest side no matter the destination, people stress this point more so when coming to Japan for a couple of reasons; Firstly, the accommodation is ‘cozy’. By cozy I mean cramped. Japan Hotel/hostel rooms are renown for being tight, so fitting your bodies as well as your suitcases in a room can pose a real challenge if they are as big as you. But more so than that, people warn that riding on public transport with a large suitcase is a nightmare, and it truly can be. There truth to the myth that suburban trains can be packed like sardines and if you are unlucky enough to catch a morning or afternoon train with your luggage, you will have a bad time. Also, regional express trains don’t have luggage compartments so you either need to have them take up the seat next to you or if it’s a packed train, somehow squeeze it between your seat, legs and the seat in front of you [if actually possible.] Even the shinkansens only have a handful compartments to secure your luggage. If you can bring a suitcase or backpack that is 80L or less you should be able to chuck it on rack above the seats. Locals have been known to put some bulky objects on there so no harm trying. My last point on luggage is if you haven’t forwarded your luggage and you want to day trip while in transit from one city to the other, it’s still possible! All train stations have lockers and the larger stations have large lockers that allow you to store a medium sized suitcase away. Once you confirm the size of your bag will fit [check out the specs at japan-guide.com] the only real issue is be sure the station will have large lockers. We stored our bags at Okayama station for a day trip while in transit from Kurashiki to Kyoto. Any station serviced by a shinkansen will definitely have good number large lockers. Smaller stations may be a gamble. found your posts by goolgling about Japan’s airport luggage shipping services. do not offer such service. As you wrote on the post, the service in Japan seems really convinient. I’d add that it’s summer all year round inside most train carriages. Layers, a fresh juice and a tasty treat from Mister Donut will do you wonders.